With the BOX TENGOR you’ll start taking good pictures straight away. It is so simple to use that you couldn’t go wrong. The BOX TENGOR is the Ideal camera for a beginner. Even a child can use it. It’s indestructible metal body will stand more than an occasional knock. Many generations of photographers have learned the art of photography with the Box Tengor, which was first made in a quite simple form over 88 years ago. Since then numerous valuable features have been added to the instrument which justify it’s title of the arttiocrat of box cameras. As the camera is not a worthless toy it should be treated with care and not exposed to rain or left on wet grass, etc., but kept in its leather case in a place where it cannot be damaged. The care you devote it will have a good effect upon the film, the lens and, above all, the picture. 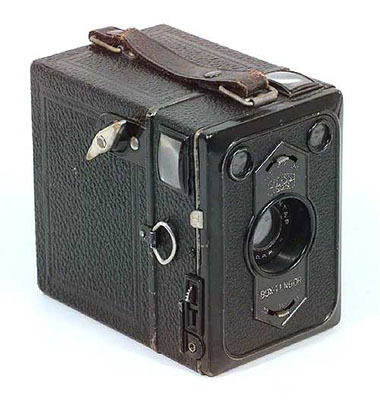 The Box Tengor line was carried over from the Goerz line into Zeiss Ikon after the merger in 1926, and the line was given the Zeiss model number prefix 54. Initially there were only three models, 54/2 for 6x9cm on 120 film, 54/15 for 6.5x11cm on 116 film, and 54/14 for 5×7.5cm on 129 film. They have a plain leather front, have two finder optics in a vertical line on the front, and the winding key is towards the bottom of the camera. In 1928 the camera is remodeled. The finder optics are now side by side, and the winding key is moved towards the top of the camera. In 1931 the Baby Box Tengor is introduced in two styles with catalog numbers 54/18 and 54/18(E). I have covered them in a separate section, Baby Box Tengor. The entire line was remodeled again in 1933/34. The front of the camera was given a decorative hexagonal front plate. The 54/14 size was discontinued, and the 54 for 4.5x6cm on 120 was introduced (this format does not have a suffix). The 54/2 and 54/15 were discontinued in 1938, leaving only the 54. It was discontinued the following year. 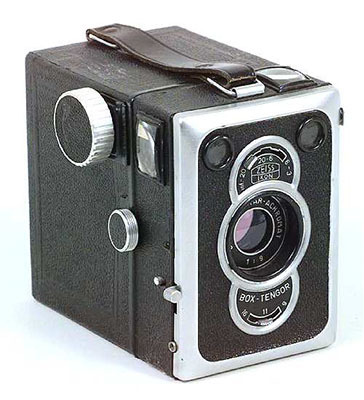 In 1939 the Box Tengor 55/2 was released as a replacement for the 54/2. It has a double exposure prevention built into the wind system. After the war, the last model of the box Tengors was to be sold. It was the 56/2, for 6x9cm on 120 film. It is easily recognizable by the satin chrome trim around the front. It has a Frontar f/9 lens, and flash synchronization. Production ended in 1956. You like to try to work with 120 roll Film? With a lot of pleasure and good photographs? 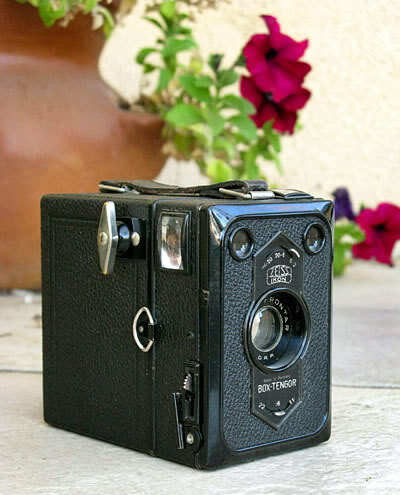 The Zeiss Ikon Box Tengor is just for You!